This blend of 80% Grenache and 20% Cabernet Sauvignon is light-bodied and fruit-forward. Aged 12 months in Missouri oak, it has notes of cherry, plum and white pepper and a soft, smooth finish. Our Barbera has a ruby purple color with ripe red cherry and vanilla aromas and hints of violet. On the palate it shows bright acidity and soft tannins with good integration of oak, good complexity and a lingering cherry finish. Barbera doesn’t need much aging, and should be enjoyed in its youth – at the height of its exotic blend of distinctive flavors. It will pair perfectly with veal, poultry or some marinated flank steak lightly seared on the grill. This dry, French-style rosé is made from our signature grape, Cabernet Franc. The color of this gorgeous wine comes from a short soak on the skins for a couple of hours prior to fermentation. You get the scent of strawberry on the nose, but in the mouth the tannins highlight the dryness of this rosé, just as they do in the southern region of France. This wine was aged six months in neutral Missouri American Oak red barrels to enhance the mid-palate structure of the wine. Our Cabernet Sauvignon is medium-bodied with bright flavors and aromas of cherry and raspberry and a medium tannin structure. The wine was aged 12 months in Missouri oak barrels, giving just a subtle warmth to the wine. The Cabernet Sauvignon is, without a doubt, one of our most food friendly wines. It goes with anything and is across the board a people-pleaser. 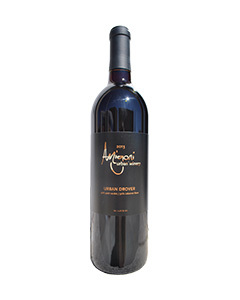 Our 2014 Cabernet Sauvignon took home a Medal of Excellence at the 2015 Jefferson Cup. This wine is where it all started. Cabernet Franc was the first grape we planted and the first wine we made. Cabernet Franc and Sauvignon Blanc are the parent grapes of Cabernet Sauvignon. Even though the varietal shares DNA with Cabernet Sauvignon, they are very different. Cabernet Franc ripens about a week faster than Cabernet Sauvignon, making it more adaptable to cooler climates. It grows best in sandy terroir, like the sandy loam soil at our vineyards. This wine is smooth and earthy with hints of berries and tobacco on the nose. It hits the palate with intense fruit and peppery accents. Eighteen months of oak aging give this wine deep tannins that linger on the finish and notes of oak and spice. The 2014 Cabernet Franc took home a gold medal from the Finger Lakes International Wine Festival. Past vintages of our Cabernet Franc have taken home multiple medals from the Indy International Wine Competition and the Jefferson Cup. Perhaps we were destined to make this particular wine. Tracing the Amigoni family tree from Italy, we found Grandmother Amigoni, who immigrated through Ellis Island in 1921, was listed on the books by her maiden name, Merlo. It was pronounced just like the wine in this bottle. So, with this, we honor our grandmother. This Merlot is full-bodied and bold with aromas of plum and dried fig. It is fruit-forward with flavors of cherry and blueberry and a nice tannin backbone that will allow for longer aging. It was aged in Missouri oak barrels for 14 months before it was bottled. Serve this with steak, braised short ribs or pork tenderloin. The 2014 Merlot won a silver medal at the Finger Lakes International Wine Competition. A delicate blend of 90% Tempranillo and 10% Merlot is what gives this delightful wine its gusto. Tempranillo is a spicy varietal that traces its beginnings to Northern Spain and ripens several weeks earlier than most grapes. Combining it with Merlot adds a bit of softness to the finish. 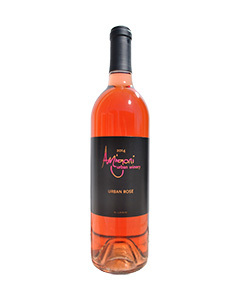 This medium-bodied wine offers a fruity, plum-like bouquet with aromas of vanilla and spice. It has silky, velvety tannins that coat your mouth, especially mid-palate. It’s spicy and smooth with hints of oak on the finish. Pair this with regional Spanish cuisine, like roasted vegetables, cured meats or chorizo dishes. It would also be delicious with steak, lamb or roasted chicken. The 2014 Missouri Urban Red is our Bordeaux-style blend of 83% Cabernet Sauvignon, 7% Cabernet Franc, 7% Merlot and 3% Petit Verdot. 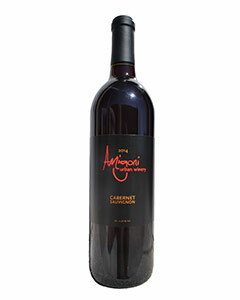 Three of the four varietals in this wine are from the Amigoni Estate Vineyards in Centerview, Mo. 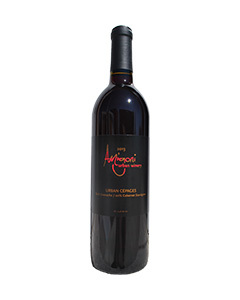 It is a medium-bodied wine with aromas of black cherry and cedar. It starts with intense fruit on the front and hints of spice mid-palate. It was aged 18 months in Missouri oak barrels and has a medium tannin structure with spice and earthiness on the finish. Open up a bottle next time you fire up the grill. It would pair perfectly with steaks, lamb and pork dishes. 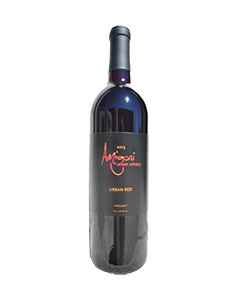 Our 2013 Urban Red was awarded a Medal of Merit at the 2014 Jefferson Cup. A blend of 50% Cabernet Franc and 50% Petit Verdot, this wine is our tribute to our historic tasting room building. It has a nice, mature nose with flavors of dark cherry and spice. It was aged 18 months in Missouri oak barrels to gain complexity and depth. A previous vintage took home the Medal of Excellence at the 2012 Jefferson Cup. From the To Kati bloc of our estate vineyard, we present our 100% Petit Verdot. This wine is aged longer than any other wine in our portfolio. We make a very limited quantity of this wine, and when it’s gone, it’s gone! Our Petit Verdot is a full-bodied wine with lots of dark concentrated fruit flavors and a smooth richness that only barrel aging can achieve. Pair it with ribs, beef tenderloin or blackened fish. An earlier vintage of our Petit Verdot took home a Medal of Merit at the 2014 Jefferson Cup. Dark and silky with bold aromas of dried herbs and plum and flavors of dried fig, black currant and mulling spices. Cinsaut is primarily a blending grape or is often used to make rose. Finding a 100% Cinsaut is rare. This wine was aged 12 months in Missouri Oak Barrels.